The Enforcement Directorate on Wednesday told a Delhi court that custodial interrogation of former Union minister and Congress leader P Chidambaram was necessary in the Aircel-Maxis money laundering case to unravel the truth as he was evasive and non-cooperative in the probe. The ED opposed his anticipatory bail saying that from the conduct of Chidambaram, who is a "highly influential and well connected individual", there was a serious apprehension of his influencing the witnesses and tampering with evidence pertaining in the case. The agency sought custodial interrogation of Chidambaram on the ground that he has not been cooperating with it in the probe and hence making it difficult complete the investigation in a time bound manner as directed by the Supreme Court. 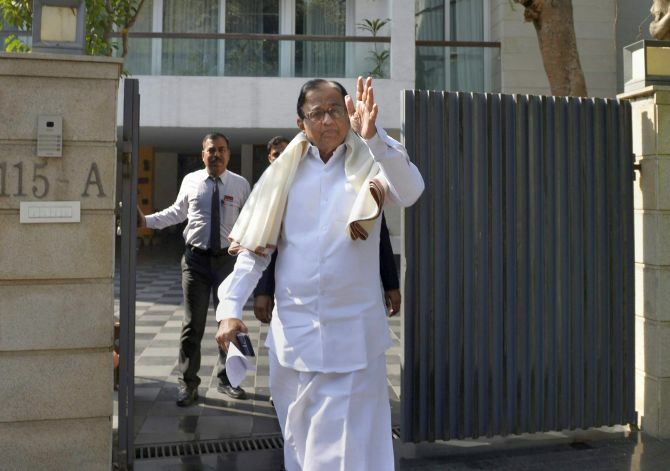 The agency, which filed its response to the anticipatory bail plea of Chidambaram, said that he has remained evasive and therefore grant of pre-arrest bail at this stage would be highly detrimental to the investigation. "From the conduct of the petitioner, which gets amply demonstrated from the records available, the investigating agency has reached a bonafide conclusion that in the absence of custodial interrogation it will not be possible to reach the truth of the allegations as the petitioner has chosen to be evasive and non-cooperative," the agency said. It said Chidambaram, being a senior advocate practising in the Supreme Court, a Rajya Sabha MP and former union minister, "is a highly influential and well connected individual. Therefore, there is a serious apprehension of the applicant influencing witnesses or tampering with evidence pertaining to the present case." The agency said that the investigation pertaining to Foreign Investment Promotion Board approval fraudulently granted by Chidambaram has got several dimensions having wide ramifications. The investigation, it added, has been concluded to some extent and with regard to certain issues was still going on. The hearing on Chidambaram's plea will take place before Special Judge O P Saini on Thursday. The court had on October 8 extended till November 1 the interim protection from arrest granted to Chidambaram and his son Karti in the Aircel-Maxis case filed by the CBI and the ED. The agency on October 25 had filed charge sheet against Chidambaram in the Aircel-Maxis money laundering case, accusing him of conspiring with foreign investors to clear their venture. The others named in the chargesheet filed are: V Srinivasan (former CEO of Aircel), Augustus Ralph Marshall (associated with Maxis), Astro All Asia Networks Plc Malaysia, Aircel Televentures Ltd, Maxis Mobile Services Sdn Bhd, Bumi Armada Berhad, Bumi Armada Navigation Sdn Bhd. The nine are accused of money laundering of Rs 1.16 crore in lieu of illegal approval by the FIPB accorded by the former minister in March 2006. The approval was given to the foreign investor Global Communication and Services Holdings Limited, Mauritius in violation of the various rules and regulations governing the FDI policy in India. Filing the second supplementary charge sheet, the ED had said: "As per rules and FDI policy of Government of India in 2006, Chidambaram, the then Finance Minister was empowered to give approval of the foreign investment to the proposals involving foreign investment up to Rs 600 crore only." The foreign investment proposal of Global Communication and Services Holdings Limited was of USD 800 million which amounted to Rs 3,560 crore approximately (when 1 USD was Rs 44.5), it had said. "The foreign investment proposal of Global Communication and Services Holdings Limited should have been referred to Cabinet Committee on Economic Affairs but it was not done and approved by Chidambaram under a conspiracy," the ED said. The ED had filed the first charge sheet in the case against Karti; later, a supplementary charge sheet was also filed against him. The ED had registered the case under the sections of Prevention of Money Laundering Act on February 7, 2012 on basis of an FIR registered by the CBI. The agency had mentioned that the former Union minister's son has been linked with various individuals and companies involved in the FIPB approval given to the Aircel-Maxis deal.